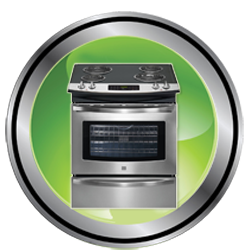 KC Appliances and Repair has become the trusted go-to range or stove repair company in the Kansas City metro area. Our appliance repair service technicians who work for us specialize in all major brands of ranges. Pin pointing the correct failing part(s) require voltage and ohms tests to diagnose and target the cause of the issue. You can be certain our factory trained technicians can get your gas or electric range back to baking and cooking your meals again in no time. Whether you have a gas or electric range you will need an expert with proper tools to get it serviced properly. There are many parts that can fail, which have to work together in order for a range to operate correctly. Ranges perform in a sequential manner, meaning it is a bit difficult to diagnose the cause of the problem if you are not trained in voltage and ohms reading. Problems can occur in either the electrical or the mechanical systems and isolating the failed part is what we do. We are confident our trained technicians, with no less than 5 yrs experience in the field, will quickly diagnose the problem and help resolve it on the spot. These range problems will only add stress, and who needs range repair stress? The life of your range/stove can be extended by regularly performing maintenance and cleaning the internal parts before they malfunction. Most importantly is the venting of the heat from oven. KC Appliances and Repair, has certified and experienced technicians specifically trained to service your range completely - from heating elements, thermostats, fuses, door latches, and control boards to cook top burners. Save your money and let us service and repair your range back to its original function. Give us a call at 816.286.4445 or 877.983.4933 x7.